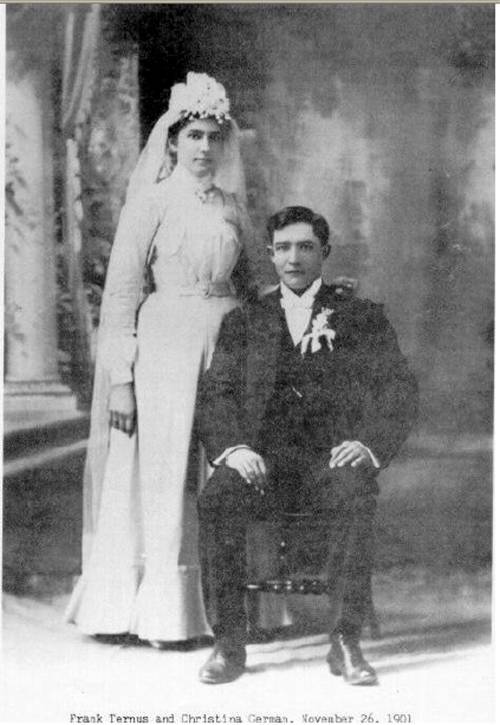 Christina married Frank Ternus on 26 November 1901, at St. Mary Church, near Humphrey, Nebraska. Frank was the eldest of eight children. His family came to Nebraska in 1887 and he grew up on a farm near the Cornlea community west of Humphrey. He received his education at Cornlea and at St. Francis parish school in Humphrey. Frank and Christina lived on a farm northeast of Humphrey. Christina passed away on April 7, 1927. Frank then married Gertrude Rebhausen Shafer on October 27, 1931. They continued to live on the farm. He served on the school board from 1903 until 1928. He was appointed a supervisor of Platte County in November of 1928 and served for 8 years. He served on the draft board during World War II. He was bank director of the First National Bank fro 1908 until 1915, and from 1915 on was a director of Farmers State Bank. He was on of the largest cattle feeders of the area. After living for 54 years on the same farm, he purchased a house in Humphrey in 1955, where he retired, leaving the home place to his oldest son, George.